Fourth Grade Nothing: We are Flintstones kids, 10 million strong, and growing! We are Flintstones kids, 10 million strong, and growing! 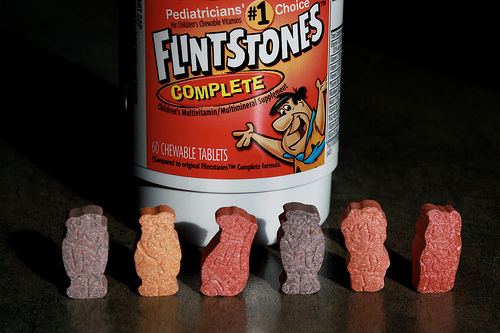 Flintstones Vitamins go way back. Growing up, I remember popping Flintstones chewable Vitamins every morning. I also remember that they didn't taste as good as baby aspirin and they're definitely not as tasty as today's gummy vitamins. Miles Laboratories first introduced Flintstones Vitamins way back in 1968 (acquired by Bayer in 1979) and they are still popular with kids and parents today. The vitamins were the most successful product spawned from the Hanna-Barbera Productions. I'm surprised to see that Flintstones Vitamins are still going strong and are even being advertised with the old school late '80s commercial jingle, "We are Flintstones kids. 10 million strong and growing!" I always loved the little kid at the very end. They would sweetly sing (solo) "... and growwwwwwing." Cool fun fact: Martin "Marty" O'Donnell is the awesome composer behind the famous Flintstones Vitamins jingle. His children were part of the children's choir heard in the original commercials. He's now known for sound design behind video games such as Halo. Check out Martin O'Donnell's classic jingle in this 1987 TV commercial for Flintstones Vitamins. I remember Flintstones vitamins, definitely! I didn't take them myself, but the jingle is as cool today as it was back then. I had no idea that the vitamins went back as far as they did, though! That's cool. I remember these tasting so good when I was a kid. I bought them for my son and he hated them. So I had one and yeah, it was gross. I wonder if they changed the flavor? Less sugar or something. I also remember the song and singing it all the time! Yep, had those. They tasted kinda icky. Also had little tiny Rx fluoride pills that had to be swallowed. Love the gummy vitamins they have for adults now. I remember for the longest time they didn't have Betty Rubble as a vitamin. Heck yeah, I remeber eating Flinstone's vitamins. I also remember scaling up the kitchen counter and into the cabinet to sneek more vitamins. Maybe they tasted too good! Just saw the commercial while watching Today. I was wondering why they haven't gotten past 10 million after all these years since they are growing. They must no be growing very fast. I bought some for my kids and they hated them. So it seems the taste hasn't improved. Glad to see others went online too these past couple of days.